The most enchanting mid-sized event space and wedding venue in Los Angeles, Hollywood Banquet Hall’s glamorous atmosphere, dedicated staff, and hands-on event planning services make it ideal for celebrations, parties, and important gatherings of any kind. 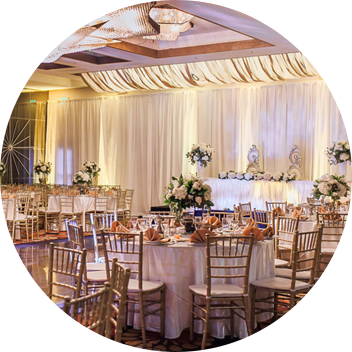 Spacious enough to accommodate up to 350 guests, Hollywood seamlessly blends Renaissance-inspired design with modern luxuries like ambient LED lighting, custom-made furniture, dazzling crystal chandeliers, and a large wood dance floor. 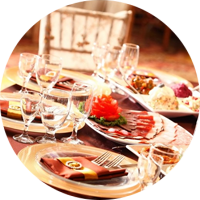 Delicious Middle Eastern cuisine, too, is an inimitable aspect of Hollywood Banquet Hall’s all-inclusive event venue experience. Depending on your party’s unique needs and tastes, Hollywood’s world class culinary team will prepare a mouthwatering array of authentic Mediterranean, Lebanese, Armenian, and Persian dishes guaranteed to inspire conversation and impress even the most discerning palates. 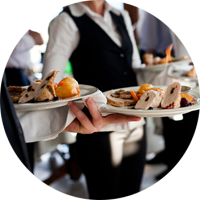 The venue’s professional event coordinators will even help you determine which service options—Hors D’oeuvres, buffet style dining, full service, or family style—will best complement your special event. At Hollywood Banquet Hall, we believe life’s special moments are best shared over a delicious meal. Our world-class culinary team will create an unforgettable selection of Middle Eastern dishes perfectly suited to your unique celebration, reception, or corporate event. Modern style meets classic beauty at L.A.’s most popular mid-sized event space and wedding venue. Renaissance-era design, star-shaped crystal chandeliers, customizable ambient LED lighting, and hand-made décor give Hollywood Banquet Hall an air of elegant sophistication. By placing experienced coordinators and professional service staff at your fingertips, Hollywood Banquet Hall ensures that every aspect of your special event—hand-selected menu options, custom LED lighting, professional entertainment—will be exactly as you imagined. Make your once-in-a-lifetime bridal celebration extraordinary at Hollywood Banquet Hall, Los Angeles’ most luxurious mid-sized wedding venue and reception hall. Featuring a seamless blend of European-style decor and state-of-the-art amenities, Hollywood’s stylish event space is perfect for even the most lavish wedding ceremonies or receptions, while our venue’s savory Middle Eastern cuisine and phenomenal service never fails to leave guests speechless. Need help planning your special day? Hollywood Banquet Hall puts our experienced wedding coordinators, event mangers, and culinary team at every couple’s fingertips. For over a decade, Hollywood Banquet Hall has been hosting unforgettable celebrations, facilitating productive business meetings, and making wedding dreams come true. As a family-owned and operated establishment, Hollywood’s managers and event coordinators care deeply about the local community; we take pride in developing relationships with the families and businesses we serve, and these personal connections lead to a level of customer service unmatched by other Los Angeles wedding venues and banquet halls. From the minute you make a reservation at Hollywood Banquet Hall until your last guest leaves our elegant event space, our dedicated staff will make sure everything meets and exceeds your loftiest expectations.